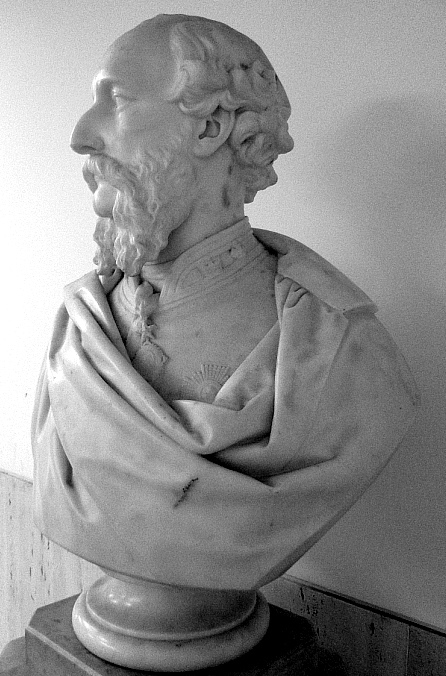 Portrait bust of Major-General Sir Herbert Edwardes, by John Henry Foley(1818-1874), R. A. This military hero and administrator appears in various articles on the Indian Mutiny. Born in Shropshire and educated at King's College, London, he took with him into his influential military and administrative roles in India a strong Evangelical zeal, and was admired by Ruskin, who extracted passages from his Year on the Punjab Frontier in 1848-49 (published by Richard Bentley in 1851) for his A Knight's Faith of 1885. Patrick Brantlinger describes Ruskin's commentary on Edwardes as "an exercise in Carlylean hero worship" (470). Edwardes College, Peshawar, in Pakistan, a Christian foundation which started as a high school in 1900, is named after him. His bust was bequeathed to the India Office by Lady Edwardes in 1904, and eventually given to the British Library. Brantlinger, Patrick. "A Postindustrial Prelude to Postcolonialism: John Ruskin, William Morris, and Gandhism." Critical Enquirry, Vol. 22, No. 3 (Spring 1966): 466-85. Edwardes College, Peshawar, Pakistan." Web. Viewed 16 August 2010. India Office Select Materials (opening page, British Library site). Web. Viewed 18 August 2010. Moreman, T. R. "Edwardes, Sir Herbert Benjamin (1819-1868)." Oxford Dictionary of National Biography. Online ed. Viewed 18 August 2010.